Jones Lake State Park Archives - GetGoing NC! My senior year in high school I went to a new school. In football, we went 0-9, in basketball, 0-18. I always wondered how our cheerleaders could muster the enthusiasm, the optimism, to encourage us to push on. In October, we suggested that winter was a good time for taking long hikes at the coast. Fewer biting things flitting through the air, fewer slithering things making their way across the ground. Today, as we’re in the throes of a sustained cold weather hiking season, we return to the coast with suggestions for shorter walks. Hiking clockwise from the Visitor Center: On a particularly cold but sunny day you’ll love the first part of this loop around the lake as it passes through an exposed pine savannah, where lots of warming sunlight bounces off the forest’s sandy floor. By the time the trail reaches the midpoint and loops back, you’ll be warm enough not to mind that the sun has been blocked by a dense sea of bay trees and pond cypress. This 420-acre preserve was spared in 1992 by The Nature Conservancy and the Town of Nags Head, thus saving one of the largest remaining maritime forests along the East Coast. 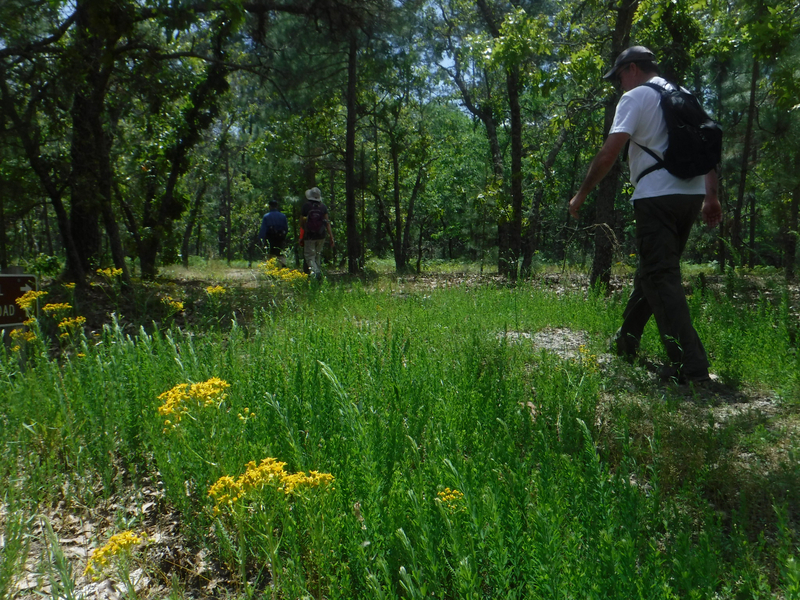 A favorite way to explore the preserve and get a sense of its more than 550 plant species (including oaks more than 500 years old) and 50 known species of butterflies, is on the 3.75-mile Blueberry Ridge Trail. How much eco-diversity can a person take on one 3-mile hike? Carolina Beach puts that question to the test, starting you off from the marina trailhead with a hike along the tidal marsh banks of the Cape Fear River, then through a coastal evergreen forest, a coastal fringe sandhills forest, a longleaf pine savannah and to the top of 60-foot-high Sugarloaf Dune, which is forested now but once proved an excellent spy tower for spotting Union ships sneaking into Wilmington. It’s 2.2 miles roundtrip and it features an abandoned WW II bunker. Of course it’s abandoned, you say — the war ended more than 70 years ago. In fact, it’s only been abandoned since the early 1970s; before that, it was occupied for several years by the Fort Fisher Hermit, a recluse who took up residence in the bunker for more than a decade. And that’s just one reason to hike this trail. The other is at trail’s end: a sweeping view of where the Cape Fear River blends into the Atlantic Ocean amid the Zeke’s Island reserve. Six miles, you fret, that might be a little long. Or it might not, for two reasons. One, this meandering trail navigates a swamp (the wetter sections are elevated by boardwalk), and nothing makes a hike zip by like the prospect of running into the Creature from the Black Lagoon. Truly, there’s something enchanting and weird about hiking along ponds carpeted in duckweed and harboring bald cypress and tupelo gum dripping with Spanish moss, and through a bevy of other aquatic plants Seussian in nature. So much to see, even in winter. Hard to believe a popular trail in a popular state park can offer seclusion, but this one does, as it encompasses stretches of dense forest, marsh and swamp. And, because the trail is wide and generally smooth, you can pay attention to these great features along the way rather than having to watch where you step. Good for either a peppy aerobic jaunt or an easy saunter to take in nature. You might think that an estuary where salt and fresh water combine to create a habitat rich in marine and plant life would be a paddler’s paradise, and it is. But with 30 miles of trail, it’s also a great place to explore on foot, to learn about the rich natural and cultural history (the park houses fossil beds and Colonial and Native American artifacts) and to experience the quiet of a coastal winter. The Taskinas Trail offers a good introduction. The fan of short hikes will like this trail for the same reason the long hiker likes it: how far you go is up to you. Hike 30 minutes out from the refuge office, or from Jericho Lane, or Big Entry Ditch, then turn and hike back. This is hiking for the mind: long passages of quiet, flat trail with minimal distraction. Winter is a great time for learning a new skill (map and compass), marveling over mother nature (learning her mountaintop secrets), or testing your intestinal fortitude (the Krispy Kreme Challenge). One of the most popular courses we offer through our Get! programs is GetOriented!, a three-hour class that gets explorers comfortable with map and compass and thus, more comfortable exploring the outdoors, especially on their own. 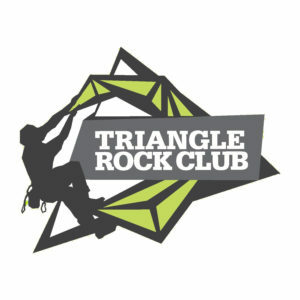 So far, however, we only offer the course in the Triangle and the Triad. So when we find a good opportunity to feel more comfortable in the woods that’s outside our current range, we’re only too happy to share it with you. 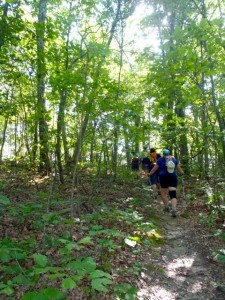 Thus, our recommendation of Saturday’s Compass Course at Jones Lake State Park in Elizabeth town. You’ll learn basic map and compass skills, then head out into the park’s compass course to test those skills. Compasses provided. Logistics: Compass Course, Saturday, Feb. 4, 10 a.m., Jones Lake State Park, Elizabethtown. More info and sign up (it’s free, but space is limited), here. Saturday forecast: Sunny, high of 50. Looking ahead: Island Nature Tour, Sunday, Feb. 19, 9 a.m. – 11 a.m., Bald Head Island, Bald Head Island Conservancy. More into here. We challenge ourselves in many ways: physically, mentally, emotionally, gastrointestinally. And sometimes, on rare occasion, we test ourselves in all four ways simultaneously. Even if you don’t participate, it is a sight to behold (provided you don’t have a strong gag reflex). Logistics: Krispy Kreme Challenge, Saturday, Feb. 4, 10 a.m., N.C. State University. $50. More info here. Saturday forecast: Mostly sunny, high of 47. Looking ahead: Eno River Sunday Hikes, every Sunday through spring, 2 p.m. Various locations throughout the Eno River Valley. Find a calendar here. It’s a cold, winter day where you live, a light rain falls. You wonder: What’s the weather like atop one of our mountains? How much colder is it? Is it snowing? Is it windy? Do I have the gear to survive. 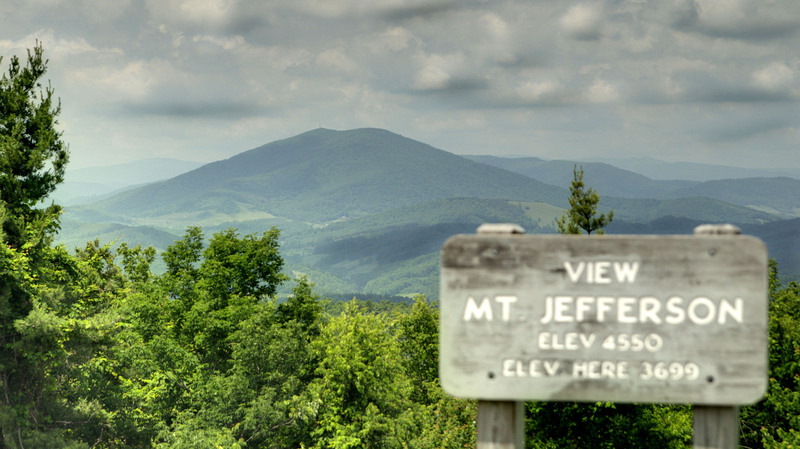 Find the answer to these questions of summit climate and more Saturday, when a ranger leads you to the summit of 4,683-foot Mount Jefferson to examine the N.C. Climate Office data collection tower. You that tower has some great weather tales to tell; let the ranger act as your interpreter. 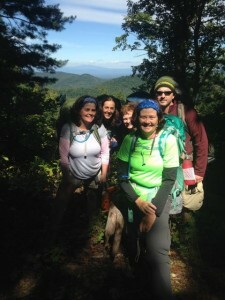 Logistics: Mount Jefferson Climate Tower Hike, Saturday, Feb. 4, 2 p.m., Mount Jefferson State Natural Area, West Jefferson. More info here. Sunday forecast: High of 42, chance of rain. Looking ahead: Flight of the American Woodcock, Saturday, Feb. 25, 6 p.m., Mount Jefferson State Natural Area, West Jefferson. More info here. The snow and bitter cold are gone. Time to get back out and explore! There’s something extra special about the Coastal Plain in winter. The still air, the open views, the absence of flying biting things. All of which makes it a great time for a hike, to learn, perhaps about the phenomenon known as Carolina Bays. What are Carolina Bays? you inquire. Sorry, you’ll have to head down to Jones Lake State Park Saturday morning and find out from a ranger on a hike that circles the park’s namesake lake. Logistics: Intro to Carolina Bays, Saturday, 10 a.m., Jones Lake State Park, Elizabethtown. More info here. Saturday forecast: High of 52, mostly sunny. Looking ahead: 9th Annual Cold Stroke Classic, Jan. 21, Wrightsville Beach. More info here. One of the many great things about winter outdoors: you can see things. Like birds, who in warmer months are shielded amidst a mass of greenery. Now, seeing birds is one thing. Knowing which ones they are is another. Learn to put names to beaks Saturday morning at Eno River State Park, when an experienced birder leads a hike in search of the park’s avian residents. Logistics: Saturday Morning Birds, Saturday, 8:30 a.m., Eno River State Park/Fews Ford Access, Orange County. More info here. Saturday forecast: High of 45, cloudy. Looking ahead: Silent Hike (no talking! ), Jan. 29, 2 p.m., Hanging Rock State Park, Danbury. More info here. “What does a forest look like after a wildfire?” That’s the question to be answered Saturday, when a ranger at Chimney Rock State Park leads in the Rumbling Bald area of the park. Rumbling Bald was part of the 7,154-acre Party Rock Fire that burned in late fall. On this hike, various experts will be on hand to explain what happened, and what happens from here. A great opportunity to learn first-hand about the role of fire in the forest. Logistics: Four Seasons Hike: Rumbling Bald Trail, Saturday, 10 a.m. – 2 p.m., Chimney Rock State Park, Chimney Rock. More info here. Sunday forecast: High of 51, 30 percent chance of rain. Looking ahead: Snowshoe Hike, Jan. 29, Grandfather Mountain State Park. More info here. Highs in the low 80s, sunny skies. Sounds like a great weekend for a hike, no? 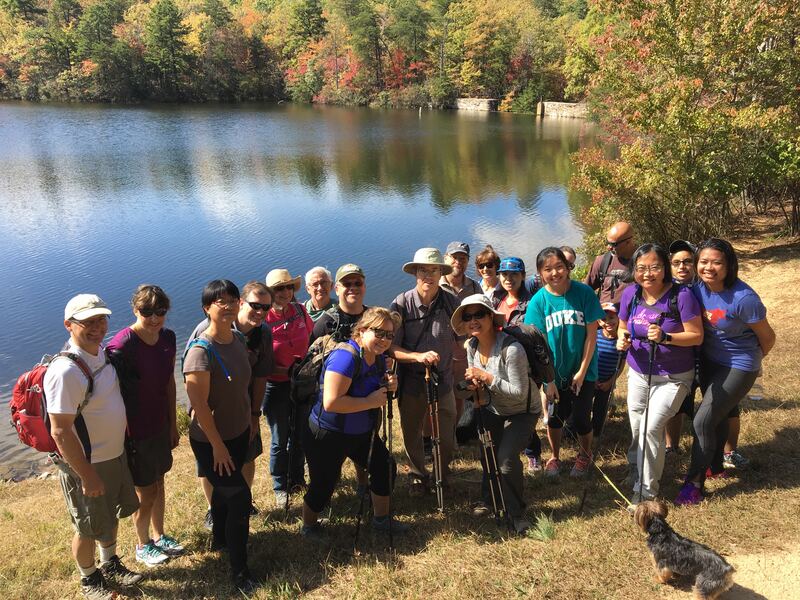 And as luck would have it, this weekend is the kick off for Hike NC, a statewide hiking initiative by BlueCross BlueShield of North Carolina, North Carolina State Parks, GetGoingNC and others. We’ll talk more about Hike NC in the coming days, but in a nutshell, it’s an effort to expose more North Carolinians to their state’s remarkable hiking resource, a resource they can frequently find right in their own backyard. We’ve got more than 60 hikes scheduled statewide over the next two months; today, we highlight the three that launch the program this weekend. Saturday, 10 a.m., Fort Fisher State Recreation Area, Kure Beach. Basin Trail, 2.2 miles. A hike tailor made for kids (of the older variety as well). 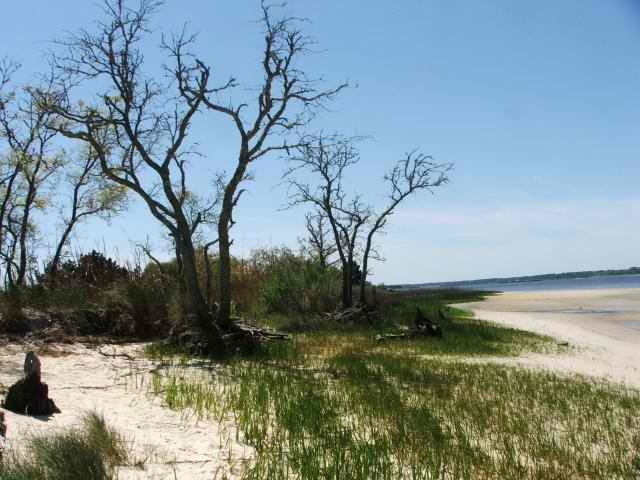 Learn the ecology of a barrier island on this easy, flat hike. Also learn the history of the Fort Fisher hermit, who for several years made his home in a World War II concrete bunker midway along the trail. Saturday, 10 a.m., Jones Lake State Park, Elizabethtown. 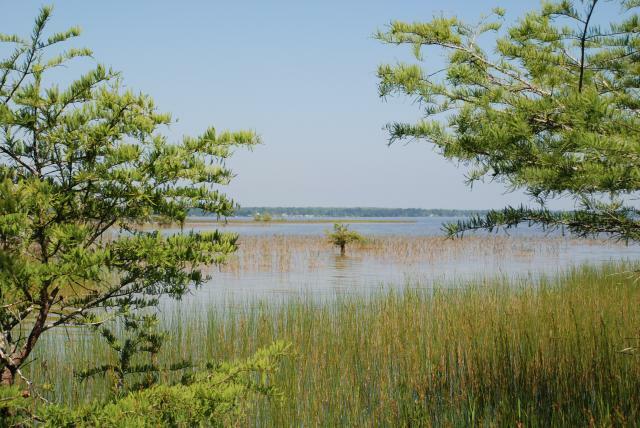 Roughly a half million Carolina bays dot the Southeastern United States; learn the story of this one on a hike of the mile-long Cedar Loop lead by Park Ranger Garrett German. Saturday, 1 p.m., Haw River State Park, Iron Ore Belt Access, Great Blue Heron Trail. 3.8 miles. Easy/moderate. The terrain is rolling but the trail is not on this loop that manages to stay level-headed on its way around a wetland. There’s a great history to this new addition to the North Carolina State Parks system, one you’ll learn about from Hike Leader and Park Superintendent Kelley King.